A wise man once said, to solve the problems of the future, you've got to first resolve the problems of the past. But then again, this said same idiot also eats rice with a spoon and isn't a big fan of the following comic book created by James Tynion, Riley Rossmo, and published by DC Comics, in April, 2016. So what does he know, eh? TO QUOTE H. Allen Smith: 'The human animal differs from the lesser primates in his passion for lists'. In a strange way this final issue of Batman ends the series on a perfect note. 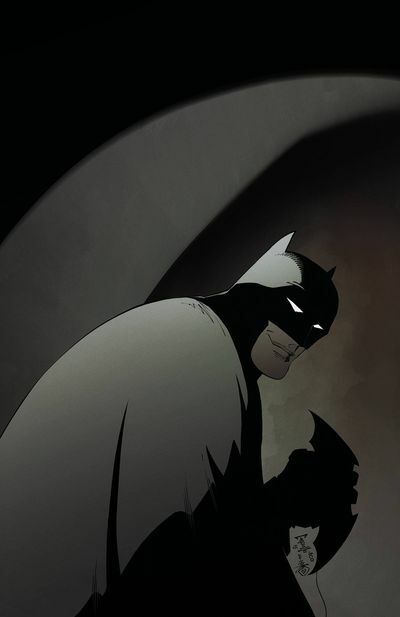 Essentially it tells the tale of how a young Bruce Wayne was encouraged to write a list, spurned on by the venerable Doctor Leslie Thompkins (A very bohemian looking Doctor Leslie Thompkins) to put down on paper what he needs to do so he can come to terms with his parent's recent death, which took place two weeks previously. Then, once that part of the plot is firmly put in place, the story next takes what seemingly feels like a slight departure. Whilst one section of the plot shows how a teenage Bruce was taught numerous lessons by numerous teachers (in order for him to become the Batman), another part of the plot shows him in present day form, attempting to take down a colorful thief who call's himself Crypsis. Turns out, Crypsis has the uncanny ability of teleporting himself from one place to another, as well as being able to faze himself through walls and floors. Plus to add insult to injury, his present battle with Batman relates to him steeling an artifact related to Bruce Wayne's past. No. You're not thinking what I'm thinking, are you dear reader? I mean, I know this issue is called, 'The List', and so far we've seen Bruce start to write it and then follow it! But, you don't think Crypsis has actually stolen Bruce's list? Prompting Batman to do what he does best, Ka-Pow!, intertwined within numerous scenes showing him learning a technique, and then using that technique in present day time! Yep. That's the ticket. That's precisely how this episode of Batman plays out. One part of it is basically an origin story, where we get to see a young-ish Bruce Wayne learn the art of being unseen in Japan, how to resist pain in Canada, plus skydiving in Yugoslavia, whilst the other section is a pretty decent battle despite the obvious punch line. Personally, I liked reading this story an awful lot! 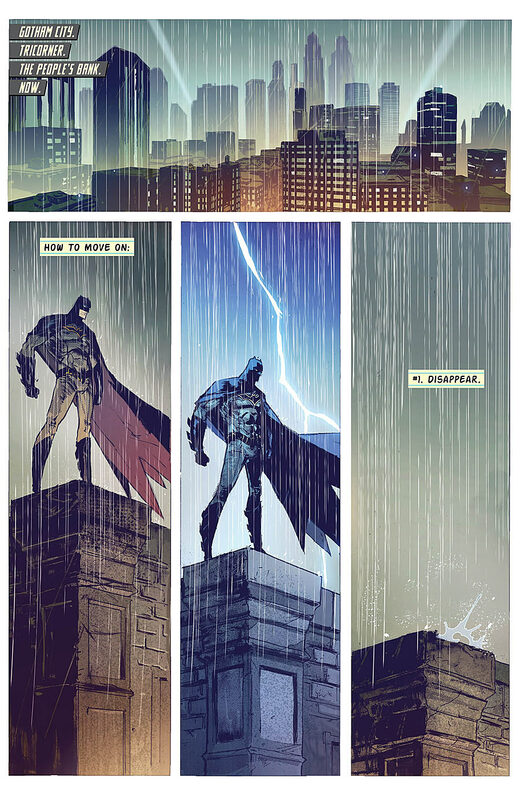 James Tynion has managed to give it a nice personal tone, and I especially liked the way in which it tied itself back to Batman's background as well as Bruce's relationship with Alfred. One of my most favorite scenes was the one in which Alfred realizes how much he means to Bruce, almost as if old Alfie boy never even thought that Bruce might have these types of feelings for him. Moving onto the art side of things and I must say, I am somewhat conflicted with Riley Rossmo's style of illustration. As much as I appreciated his scratchy artwork, the way in which his characters showed character, plus his very pleasant pacing, in the same breath I did find it very messy at times, bordering on the baroque when he drew Crypsis. Now I know that Crypsis is meant to be a, quote, un-quote, 'silly super villain dressed in a silly super villain's costume', but that still doesn't mean we shouldn't take his character seriously, and in many ways his jovial demeanor takes a sense of validity away from James' script. Not much mind you. Just a bit. And overall I did like this tale and I am happy to have read it. For this months musical match-up I think I'm going to partner this comic with a song from times past. You know, a nostalgic song about training and the value of life. So take it away, Bill Conti, with your lovely Rocky themed anthem, 'Gonna Fly Now'. Wait a minute! If Batman is Rocky, then what does that make Alfred? The coach who dies or Adddriaaaaannnnn? A large portion of this story was dedicated to seeing Batman stop a colorful thief from taking something that wasn't his. So with that in mind, how could I not compare it to Rob Roy? 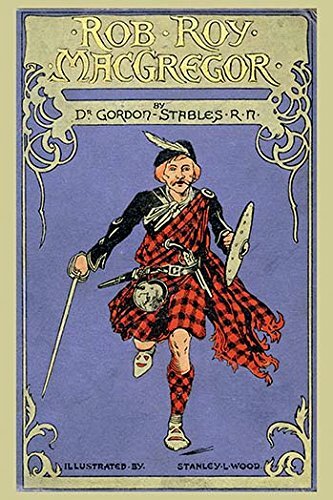 A colorful Scottish outlaw from times past! Remember your parents can sing in Flemish. In England we would have sent you to boarding school. Remember your parents like candid photography. How come I never get a costume? Remember your parents will always be proud of you.